NEW YORK—John McDonagh has never delivered a baby in the back seat of his cab, but he’s come close. 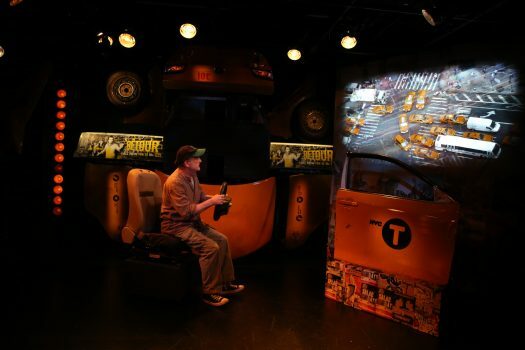 Mixing the hilarious with the bittersweet in his one-person show, “Off the Meter, On the Record,” he looks back on his 35 years of driving a taxi in New York City as seen from the front seat and rearview mirror. This engaging production runs on all cylinders at the Irish Repertory Theatre. The son of Irish immigrants, McDonagh got his hack license in the mid-1970s. It was intended to be a temporary gig, but as the years and decades went by, he still found himself behind the wheel. He did switch to the day shift as soon as he could, as the night was much more dangerous. McDonagh started driving in the days before taxis had air conditioning. It got so hot in the summer that he could, as he puts it, finish a shift drenched in sweat, rub his face, and see the pollution come off on his hand. While conditions have improved since then, it’s still a pretty hard life. Even the horses in Central Park have it better than cabbies. The animals get regular medical checkups, vacations, and time off when it’s too hot or cold. Cabbies, on the other hand, are always expected to be on the road. McDonagh comes across not as a particularly endearing or welcoming character, but as just another working stiff—one you wouldn’t look twice at if you walked past him. He speaks with an air of authenticity and just a hint of attitude—in other words, as a quintessential New Yorker. His words are laced with resignation and wry nostalgia: In the “bad old days,” cab drivers would find themselves taking passengers to burned out buildings in Manhattan’s Alphabet City and then waiting while they went inside to conduct a drug deal. Other things McDonagh has come face to face with during his tenure include the homeless, racial tensions, and numerous drunken passengers, like one man who got into his cab, gave him a destination, and then collapsed. When they got to where they were going, the guy was too inebriated to get out of the car. This led to McDonagh calling the cops, but their presence quickly attracted a crowd of agitated onlookers, and the entire situation threatened to spiral out of control. 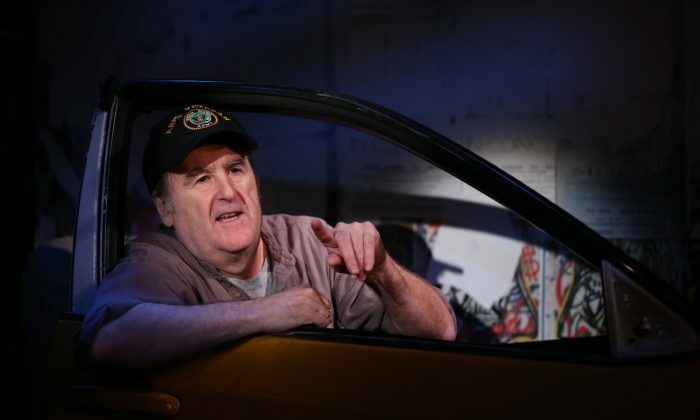 In addition to driving cabs, McDonagh is also a writer, performer, radio personality, and political activist. His notoriety makes him a sort of unofficial go-to guy for the media. He once took actor Stephen Fry, who was working on a travel show at the time, to a club run by folks who looked like they came directly from central casting—with names to match. McDonagh let it drop that he knows far more about certain illegal activities than he should. In the political arena, he organized C.A.B. (Cabbies Against [President George W.] Bush). This, coupled with his anti-war stance, led to C.A.B. offering free rides to the airport for any Republican member of Congress who was willing to fight in Iraq. This led to some interesting encounters with Fox News, including an on-air interview. There was also the time McDonagh found himself part of an international incident regarding a message displayed in Times Square. The set by Charlie Corcoran, including pieces of actual New York yellow cabs, is excellent. Chris Kateff’s projection design, showing footage of many of the incidents and places McDonagh describes, is nicely integrated into the production. Michael O’Connor’s lighting works well, and director Ciaran O’Reilly is able to bring the different elements together to work in perfect unison, with a very illuminating sequence to tie things up. An absorbing portrait of a city and society in continual flux, as told by someone who has lived through it, “Off the Meter, On the Record” makes for an extremely satisfying journey.